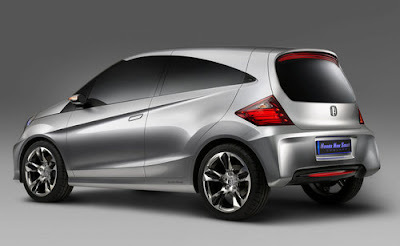 We'll here's a New Small Concept by Honda. No really, it's called the "New Small Concept." Slated for sale in 2011 and debuting at the Auto Expo 2010 in New Delhi, the car will be intended for the Indian and Thai markets, perhaps taking aim at the Tata Nano, although it will likely be a bit more expensive. Honda is saying the car will be very efficient and will seat five people. I think it's great looking car; the rear pillar/glass area even looks a tad Mercedes-like to me. It will be interesting to see the full production version. 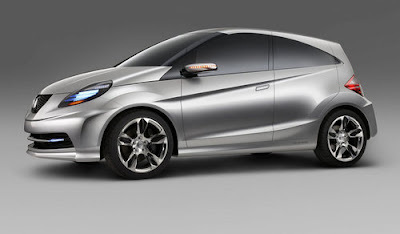 However, Honda typically doesn't deviate too much from its concepts. Meh. To me it looks like something morphing from a Scion to a Fiesta to a Fit.....from front to back. Maybe a little Spark thrown in.